The Naturesave Guide To Being Green Bee’s, biodiversity and solar farms…. Don’t get me wrong, tidiness can be important. No-one likes to see litter. Long grass can impede visibility at some junctions. Dense vegetation can make urban parks unsafe. But what I’m talking about is different. It is excessive. It is pointless. It amounts to the relentless sterilisation of precious habitats. Wildflower patches annihilated with herbicide, autumn leaves purged from lawns, hedges battered into perfect squares, rotting trunks exiled from forests. The examples are endless. Gardens, farms, parks, verges, canals, woodland, wasteland. Nowhere is safe. We’re a nation of gardeners. The garden is nothing but an extension of our home and the average Brit spends 114 hours a year getting it ‘just so’. All this toil usually results in a manicured green desert. For me these feel unexciting and forlorn. Yet, messy gardens effortlessly have depth: the understated beauty of flowering “weeds”, a clumsy bumblebee nectaring, the bush crickets’ chorus in the long grass. And it’s not just me. There’s evidence to suggest higher levels of biodiversity improve our wellbeing and diverse gardens can be more aesthetically pleasing. Embracing nature means less work, more wildlife and a more interesting garden. So why don’t more people do it? I think the neighbours may have something to answer for. Gardens mediate many of our interactions with the people living around us. We chat over the fence and our children play together on the lawn. But this proximity can generate conflict. Disagreements over shrubberies have even been known to result in death-threats. Perhaps it’s hardly surprising we are willing to sacrifice our ideals for amicable neighbourly relations. Even without any prior quarrels, we all have some perceptions of neighbourhood norms. Fundamentally, the garden is a very public display. We maintain it, just as we tidy the house before visitors stay. Messiness is a trait we are reluctant to put on show. 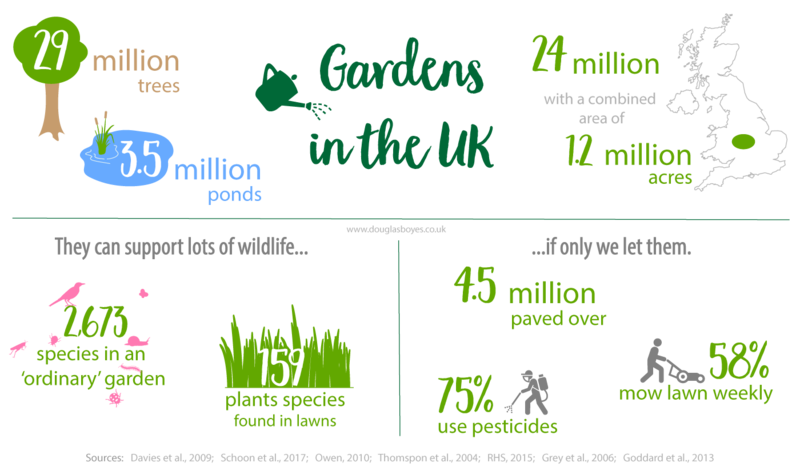 Gardens: Britain’s largest nature reserve? An uncut lawn can be misinterpreted as laziness or neglect. We worry others will think we don’t care about where we live, or are struggling to keep on top of daily tasks. 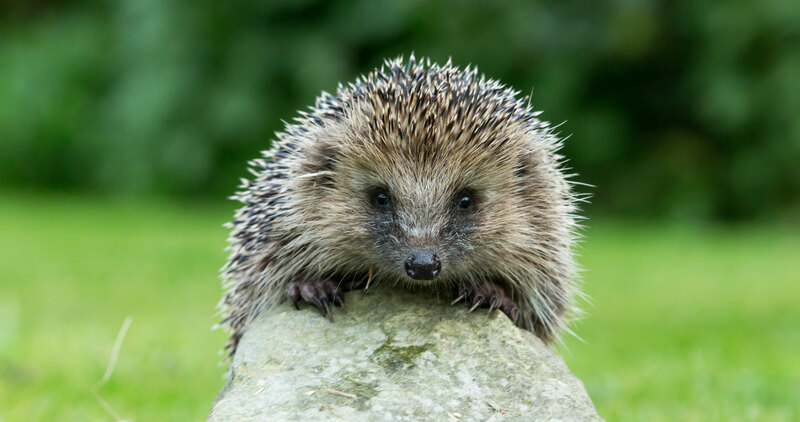 This can be a major barrier to the adoption of wildlife-friendly gardening. Public areas can be subjected to the very same neighbourly pressures and tend to get managed with the same enthusiasm for neatness. Green spaces teeming with wildlife can be the most beneficial to our wellbeing. Yet, urban planners continue to opt for neat parks, citing “public demand”. It doesn’t just stop at places for recreation. Local authorities are often under pressure to keep all grassy areas short. Come summer, and the local rags are filled with residents looking angrilyinto long vegetation or taking it upon themselves to make their street look “respectable”. Together, these tidy gardens and immaculate green spaces make up a significant portion of the country. But this is dwarfed by farmland, which covers around 70% of the UK. Shifts in agricultural policy after the Second World War dramatically changed the face of the British countryside. Small family farms gradually gave way to industrial agribusiness. As fields got larger, the space available for wildlife diminished. The length of hedgerow destroyed over the last century could wrap around the planet ten times. Engine-powered machinery, artificial fertilisers and herbicides became commonplace. This squeezed higher yields out of the land to produce vast amounts of – often surplus – food. Of course, agriculture is complex. Farmers run a business. Space is valuable. And ‘messy nature’ can harbour ravenous leaf beetles and thuggish grasses, ready to eat into profits. But tight margins aren’t solely to blame. The simple reason cited by a third of farmers for uprooting hedgerows? “Tidiness”. Tidiness symbolises control over the landscape. This closely aligns with the productionist values farmers have traditionally held. 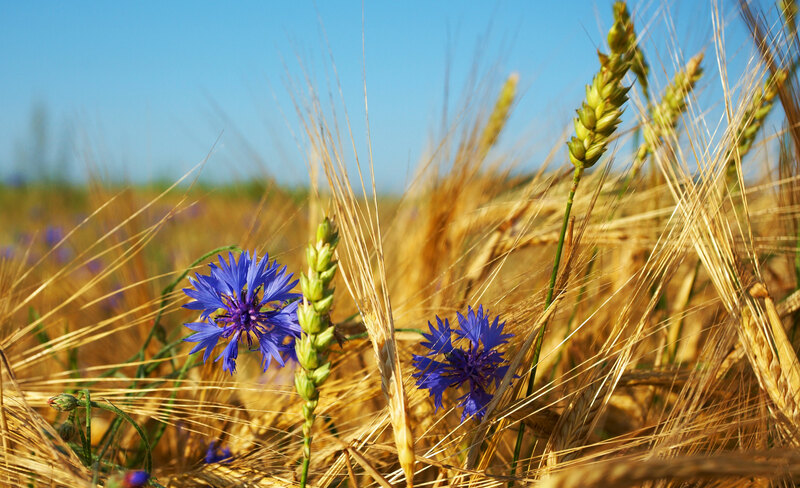 Boundless subsidies affirmed the idea that food production is sacrosanct; some farmers use words like “derelict” and “wasted” to describe uncultivated areas. These ideologies may seem outdated but they are entrenched in social norms of what ‘good farming’ looks like. Most farmers take great pride in their role as custodians. For them, stewardship is about actively making the landscape look cared for. Tidiness has simply become the sign of a good farmer. Someone who’s on top of things and knows what they’re doing. Overgrown hedges? The hallmark of laziness. Idle fields? A wasted opportunity. Flower-rich field margins? Sheer incompetence. Laziness, neglect, ineptitude – the things we associate with untidiness are almost universally negative. It’s no wonder we’re all so concerned about the appearance of our land. How did this pervasive social norm come to be? Well, it may have been to avoid deadly wildlife and diseases. But I don’t think its origins really matter. These justifications are no longer relevant. It continues mostly because it’s the done thing. This universal expectation of tidiness has been aided and abetted by increasingly powerful machinery to mow, trim, strim, saw, blow and flail. The casual destruction of habitats has never been so easy. As wildlife gets pushed out, we contract shifting baseline syndrome. We forget just how messy, complex and alive the countryside used to be. Sterile landscapes become the norm, as each generation strives for increasingly immaculate surroundings. So what can be done to make ecologically healthy areas more socially acceptable? According to Joan Nassauer’s influential essay, ‘cues to care’ are the key. These are intentional features that help prevent ‘messiness’ being misinterpreted as a lack of care. Parts of the lawn kept short, showy flowerbeds, freshly-painted fences, bold patterns and clean edges – anything that shows the owner is in control. This approach is most worthwhile in communal areas. If a council stop mowing verges close to homes, there’s often an outcry. Locals feel like their community is being neglected. ‘Cues to care’ can help avoid this. But I think we need to go further. The norms are so insidious. Pressure to conform makes gardening a burden, not a pleasure. Failure to conform makes people ashamed of their own garden. And most fundamentally, these conventions spawn an aversion to ‘ordinary nature’. Where it causes no harm, why can’t unkempt nature be the norm? If we want to save our wildlife, we must learn to love nature in all its messy glory. Of course some people already do. Throughout the country there are farmers and gardeners doing their bit and embracing nature. Going against the grain often takes courage so this deserves praise. For a laissez-faire approach to become widely adopted, people will need to stop seeing wildlife as a blot on the landscape. This needs education. A little bit of ecological understanding goes a long way. It confers an appreciation of complexity. It lets us see nature through a new lens. A patch of obnoxious nettles metamorphoses into a vital nursery for butterflies, that tenacious yellow weed is transformed into an indispensable fount of nectar for bees, an overgrown eyesore becomes the saviour of foraging birds. Levels of ecological illiteracy may be high, but I firmly believe most people do care about our wildlife. A bit of guidance and encouragement is all that’s needed to turn this concern into positive action. One promising stimulus is the plight of pollinators (every cloud, eh?). This has become firmly lodged in the public consciousness, which appears to have boosted the acceptability of ‘messy’ flower meadows. Admittedly, flowers are the easy bit (pollinators are a diverse bunch that also require nesting sites, dense vegetation and larval foodplants). Happily, there’s evidence people in urban areas can also tolerate drab and messy patches if they are made aware of their biodiversity value. Tidiness may be everywhere we look, but our wildlife clings on. We can all do something to help. If you preside over outdoor space – no matter how big or small – you can make a difference. What’s more, you can do so simply by sitting back and letting nature flourish. At first, it may be baby steps. Letting a small corner of garden run completely wild, or giving the mower a break while the clovers are in flower. And then if you have the time, go wild. Add native plants, dig a pond, or create a dead wood pile. Build it – and they will come. And of course, the wildlife won’t be the only thing to benefit. 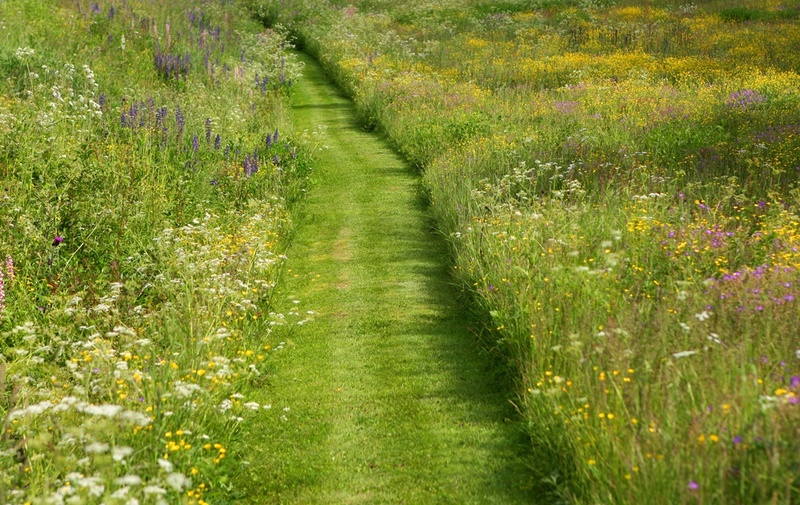 I found converting part of my lawn into a wildflower meadow immensely rewarding. Within a year the patch was abuzz with bees. Come autumn, the garden was filled with the tinkling songs of goldfinches, feeding on the seedheads. The next step is to spread the word. Be sure to tell neighbours, family and friends about how you’re sharing your garden with nature. Although, don’t merely defend it – be proud of it! Enthusiasm is infectious. Contact those in charge of public places you use – parks, hospital grounds, road verges, railway stations, etc. Their management probably reflects the assumed preference of public, or complaints from a vocal minority. Let them know you’d appreciate more alive green spaces. There are some reasons to be optimistic. A garden which included buttercup meadows and native woodland recently won the public vote at the world’s most influential gardening event, the Chelsea Flower Show. So okay, this may be ordered untidiness, but it’s a step in the right direction. Perhaps gardening fashions are changing. If enough people release their gardens from the tyranny of tidiness, we’ll forget why we do it. We’ll see just how inefficient, unnecessary and detrimental obsessive tidiness is. Our wildlife would certainly be better off – and we’d be all the richer for it too.